You’ve decided you want to let your kitty feel the fresh air in their fur, but it’s too dangerous to let them out on their own and you don’t have a garden or it’s too impractical to cat proof it… the solution? Harness train your fur baby and take them for a walk! Or – more realistically – let them take you for a walk! After you’ve decided you don’t mind being laughed and/or stared at, the next thing you need to consider is the type of harness or jacket you wish to buy and the type of leash too. Harnesses come in two basic types: Straps and Jackets. As long as you buy good quality products, both are fine to use, it really comes down to personal preference. We actually have both, as modelled by our very own Lula 🙂 We find the jacket is quite a bit easier to get on than the straps, and also if you have more than one cat sharing the jacket, you can adjust the size easily using the velcro; with a strappy one, it’s a lot more fiddly to adjust the sizing. You can find jackets for sale on our store here. Whichever type of harness you use, make sure it is secured sufficiently so there’s no room for your kitty to wriggle out, but don’t make it so tight that they can’t breathe! Make sure you can fit two fingers between the jacket or the straps and your kitty. You’ve bought your equipment, you bring it home, you manage to get it on your kitty with only light-medium scratch marks (don’t worry – the scars will fade in time!)…. you open the door ready to greet the world when …. nothing!!! Your kitty is laying on the floor, and all of a sudden has gone from graceful feline to a lump of rock! Moreover, a lump of rock that just will not budge, no matter how much you try to show them how nice the fresh air is! Eeek! What now? Start off with small steps. Indoors. Put the harness or jacket on them and give them a treat or two. Leave it on for only a few minutes. Repeat a few times during the day and for the following days, leaving it on for a bit longer each time. Play with your kitty’s favourite toy to distract their attention from the harness/jacket so they get used to moving around with it on. Once you feel they’re comfortable with the harness or jacket and they’re moving around freely, try attaching the leash and repeat the whole thing. Start off with just a few minutes a few times a day and build up over a few days. Follow these steps and we’re sure you will be successful! Our Lula is not the easiest cat to train… so if she can do it, most can! She happily trots around the garden and the field now taking our mummy for a walk! But remember there are some kitties who just are not comfortable going outside and who don’t want to go for a walk, so don’t try and force the situation – if they’re happy being indoor kitties, then that’s what they need to be! Thank you for this very enlightening article! Lula is a beautiful, beautiful kitty and I guess if she can do this then maybe I should try it with my kitties as well! my 3 year old tabby took to the leash & harness & loves to walk.i did’nt even have to train him when i adopted him at one,he went right to it the day i brought him home!! The best part is since I’m from Asia, people stared at him & say how gorgeous he is cos they never seen any cats with that kind of fur markings.. Not much people knows about Bengal here in my country.. They are consider rare breed & exclusive & quite expensive to adopt.. For me, yes, he is expensive..for the love of Bengal & their silky pelt fur.. Overall his doing really fine since day 1 I got him 3 weeks ago (21june2013).. His 100% toilet trained & that’s the best part..
Well, should invest a lil for his harness n comfortability sake.. I used to walk a few miles nearly every evening down our country road. My faithful long hair calico mama kitty would follow me the whole way. Seldom had a car pass us and we could hear them for a long way off. Kitty would just get off the road and I would stop, then continue the walk after they passed. I’m sure it was a sight to have a cat following me like a dog! The same cat fishes in the lake from the shore. She’s quite successful! You didn’t mention how to stop her paying attention to the leash. Because most of her toys are rope based so how can I make the distinction between just the leash and the the toys? We just adopted a blind bengal cat that had run away from his cattery. He needs mental and physical stimulation so I thought I’d try walking him. Would you suggest a vest or a harness? I’m considering this because my younger kitty, Lilly, is trying to bolt out the door if I’m not careful. She sees me feeding two strays outside, so maybe that is why… not sure. It alarms me because I know that the world IS a scary place out there and I don’t want to lose her. When she gets out, she hides under my car right there in carport, and I can usually get her to come out with a toy or treat… so I try not so scare her, but I get so upset and scared when she gets out… I thought maybe teaching her to walk on leash would satisfy her. Her buddy, Simone, doesn’t seem to have much interest. I had Simone out in a harness when she was young, and she managed to get out of it when she got spooked, and scared me, too. Plus, she didn’t seem to have much desire for going out… but maybe if she saw Lilly go, she would. But another reason, I don’t want to use a harness. Sorry to hear that, Christine. Our harnesses are very safe, we’ve not heard of any kitties escaping from them. Hi Roz. We’re sorry to hear this and sorry we’ve taken a little while to respond. It sounds to us like your Bengal needs a lot more activity and play time! Try walking him just round your yard to start with until you both get used to each other. Also, play interactive toys with him such as the dragonfly we sell or Da Bird etc. You need to play with him for at least 10 minutes per session, 3 times a day. Bengals are not like most cats – they need lots of activity, just relying on him having a scratcher isn’t enough. Is there any way you could cat-proof your yard, or part of it, (see our other article on how to let your cat out safely), so you could safely let him outdoors more often, on his own? Hi! Thank you for this wonderful Bengal resource. I want to train my Bengal to be comfortable outside on a leash and would love to walk her around the block to rein in some of her excess energy! I like the idea of getting her used to being outside in a small area first, and I do have a small backyard behind my apartment, but my upstairs neighbor feeds some of the neighborhood cats (there’s about 3 of them) and I don’t know if the scents of 3 strange cats would be too much for her to handle while also adjusting to a harness and leash? I have a question. My bengal was a street cat before she adopted me. Our old apartment had a walled yard (about 50m with 3 m high walls) and my kitty Houdini had unlimited access to the yard. We just moved to another place with a bigger yard and she cannot roam freely. I take her out on the leash, but then she turns nasty when it is time to go inside. Is this normal in Bengals? Thanks! I was wondering if you could harness train an older Bengal. I rescued a 5 year old and he was always kept inside. I wanted to try to take him outside but wasn’t sure if he is too old to train. You don’t explain how to get the harness on in the first place lol. My boy is all claws and teeth. I have tried several times to get the harness on but now he recognises it and disappears when he sees it. I have left the harness lying around all over the place, but it has made no difference. He’s not scared but stroppy. It’s just as bad when we try to put him in the pet carrier but he uses it to sleep in at least once a day. He’s a bad boy. I just recently got a Bengal kitty. I am finding she is VERY vocal. She follows me everywhere I go. But she meows all the time. I am slowly getting used to it. Sooo not used to sooo much meowing… Is this normal for a Bengal? She is about 12 weeks old. Hello Toni! Congratulations on your new kitty 🙂 Yes, Bengals are well known for being vocal. I want to transition a Bengal kitty from being an outdoor cat to being an indoor kitty. Her mom says kitty won’t be able to make the transition. Kitty is going to become our kitty and we are worried about her going outdoors. There are monkeys and other cats that are feral. Any ideas? It is hard to keep a cat of any breed indoors once they’ve been used to going outside. Can you compromise at all and kitty-proof your back yard so the cat can still go out but in a safe way? Or have a catio even? If you have to keep her indoors, make sure she has lots of activity such as high cat towers, a cat wheel (if you don’t mind spending the cash on one), toys and lots of interactive play. Keep an eye out for behavioural issues such as inappropriate toileting which will probably be signs that she is stressed and refer to your vet if this happens to see if they can help with this. 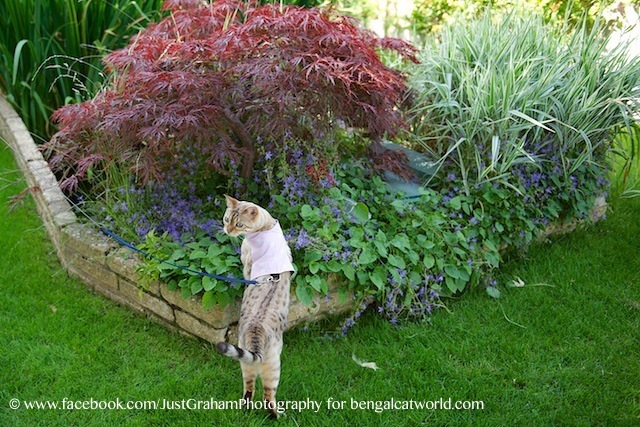 I have recently bought a Bengal kitten and I have taken her out into my garden a few times. As she has only been out 3 times these sessions have been short so she can get used to it. However since Monday she now keeps making a dash for the kitchen door to get outside. I chased her around the garden for 10 minutes when she escaped trying to catch her. How can I train her that she is only allowed outside when she has her harness on? At the moment I am having to shut her in the lounge whenever I want to go outside. It’s very difficult, Jess. I’m not sure that you will ever be able to completely train her, vigilance is probably your best bet, or otherwise maybe a catio / enclosure on the back of the house if that’s feasible so she can go out in a secure way? Unfortunately I can’t build a catio or enclosure so guess I will just have to keep trying to train her! Thanks for your help. Hi! I have a three month old, male, tiny Bengal kitty named Finnigan. I got him only two weeks ago. He is a sweet boy- even though he loves to bite (playfully)! He got accustomed to my house and the new environment in less than three hours after I got him and was already running around and playing with his toys & scratching post. However now I think that he’s ready for a walk! I have a harness, and I’ve tried to put it on him but it’s just too big! Is it okay if I wrap it twice around? How do I know if he can’t breathe? And is it a good method to put my two fingers between him and the harness when I wrap it, or will that be too loose and make it able for him to slide out (because he is so little)? My neighbors own a Bengal. He apparently doesn’t like their house. He seems to have moved to my house and attached himself to me. I say attach because I cannot open my door without him attacking me for attention. I have two other cats (adopted strays). He’s been mean to them so they spend their time over at my parents house when he’s here. He’s been here day and night for 3 days and I’ve seen very little of my own fur babies. I have to go to my parents to see them. I can’t stand that these people have such little regard for this cat. Right now add I type this he’s staring in the window at me. Ok, my question. What can I tell these people that will help keep this cat at home? I don’t care that he’s out, he hurts no-one. He’s very affectionate and follows me like a puppy. I’m afraid he’s decided I’m a better momma and he may not want to go home. What can I do? The owner family has 4 kids ages from young adult to grade school. They are a very active family. Always going somewhere. They had just gotten 2 new Bulldogs when this really became an issue. The Bengal had no problem with dogs. I saw them play together. Will Bengals just rehome themselves? Thank you for this, i am repeatedly aske how to train a cat, which i have found very hard to put into words as my 3 year old has been trained since 12 weeks old to walk on a lead and harness. I will be directing a few people this direction! acredito que a castração do animal vai trazer mais qualidade de vida para o animal outro dia entrei em uma discutição no Facebook sobre castração de animal muitos são contra a atracação eu acredito que o animal fica mais manco também mais caseira também via evitar de ser atropelado na rua. 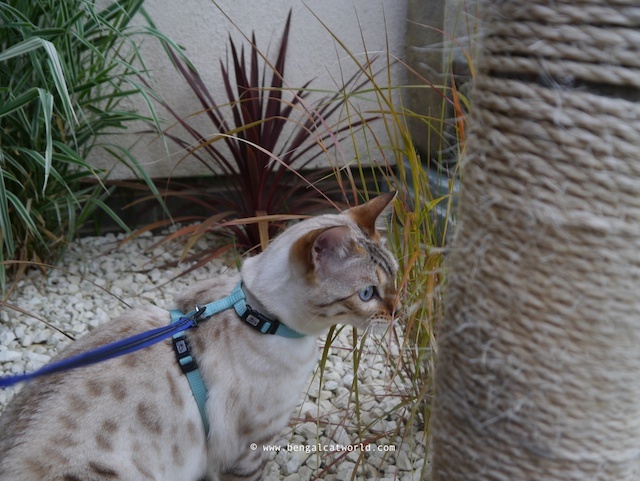 Can I use a collar on my bengal kitten? At what age do you sugest me to start traning my bengal? I’ve just got a 10 week old little kitten, and not sure when to star traning her. Hi I’m reading with interest all your comments. My cat is a half Bengal half Russian Blue 1 year old that I started to lead train using a bengal cat harness just this sunny bank holiday weekend (7 times outside so far). We’ve always had lots of playtime but she’s been definitely looking to escape outside, and despite a reasonable garden, our property is between two quite busy roads. She took to walking on the harness immediately which was brilliant, but she does get really easily spooked and had two instances where she just bolted and it was horrible to see her bucking on the lead. She’s more scared of the lead restraint than the harness itself. I’m going to do early morning and late evening and keep it to fixed times so she gets used to outside as a routine, like her going to bed routine….rather than outside on demand. She does yell to go out now and its hard to hear her crying, but its not constant. As she becomes more confident outside she might yowl incessantly, but will have to cross that bridge when the time comes. I was devastated when I lost my last half Bengal to the road. She was a free cat that I trained on a lead at 6months and then she went outside…lived 11 years but she got hit by a car and dragged herself home and died in my arms. I would be interested now to know if anyone can advise about the lead aspect and her bolting: its a 5metre extendable lead with a brake stop. She wants to bolt inside the house (at the moment) but I can’t keep up. That is soo sad that you lost you bengal cat to the road. We’ve been going out daily now: an hour in morning and the evening. She still needs playtime indoors however, because the lead restricts her running and hunting….she’s getting more confident but also a bit frustrated that she can’t get to the cheeky birds. I think she has now learned to only bolt a short distance because she will bolt and crouch under a hedge, rather than try the whole length of the garden. She’s really taken to eating grass and I don’t know if its that, or something else she’s eaten that I didn’t spot but has had quite bad diarrhoea for 24 hours ….so hasn’t been out for a day and a half. I wish you luck with taking your kitten out…. Just take it slowly so she trusts you. I have heard that animals especialy like cats and dogs] eat grass when they feel sick, hope that helps a bit. Is my kitten shy or is it normal? she is completly confident around me in my room, but when I take her out or when someone else holds her or plays with her shie suddenly pulls her ears back and her eyes go huge and round. 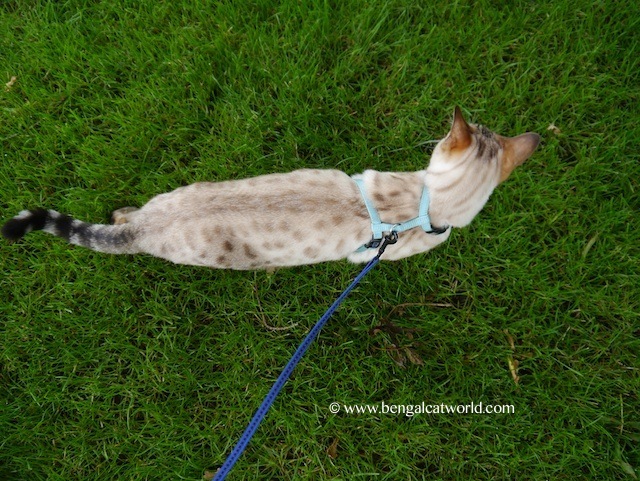 Nice Article, I have also done a review on the bengal cats.